At Silent Rivers we pride ourselves on being considerate to our clients… including their pets! When remodeling a home or building a new house, it’s important to consider the members of the family who are furry, scaled or other. Here are project photos we’ve taken where the family pets joined the fun. We also offer tips for accommodating pets in remodeling or building. This is a big kitchen we built over 10 years ago. Yet it almost look miniaturized with this big lovable guy in it. The ample space around the two islands of this kitchen makes it easier to walk around Tubby, the family’s Great Pyrenees dog who was delightful during our photo shoot last year. When you have pets, hard flooring surfaces make for easier maintenance and clean-up compared to carpet. This is also an important consideration for indoor air quality because we know what it’s like to manage pet hair and dander. Surfaces such as hardwood, tile, Marmoleum or LVT are able to be cleaned more easily and thoroughly than vacuuming wall-to-wall carpet. That’s a nice thought when house training a new pet! Warm and cozy! This basement finish we did in Clive has a special insulating foam under the basement slab, allowing the floor to feel warmer underfoot and under paw. And notice how tidy everything is. Built-in storage cabinets abound in this basement, making it easier to store things such as pet gear and toys when not in use. Opie is just one of the adorable pets in this custom new home by Silent Rivers. He shares his industrial farmhouse style home with a few other furry and scaled family members who enjoy their rural setting south of Des Moines. When it’s time for rest, the salvaged barn-wood shutters slide over the windows for an undisturbed experience. Ernie, brother of Opie, jumped into the picture of this industrial farmhouse bathroom. When we took the second shot showing how the mirror slides to reveal the medicine cabinet, Ernie had moved on to other endeavors throughout his new home. So much wonderful new space to explore! We fell in love with this adorable six-toed kitten at Ernie and Opie’s new home! While we photographed the kitchen, it was feline sunbathing time. Who wouldn’t want to hang out in this unique kitchen? Behind the tiled flag wall with steel pipe and salvaged wood shelves is a clever walk-through pantry that keeps people food and pet food organized, along with all the gear required to run an efficient kitchen for a busy family. After the photo shoot, one of the boys brought their fishbowl to the kitchen sink for a cleaning. This nicely sized kitchen island serves many purposes! Making space for pets and their needs is important to your design. Feeding stations and washing stations can help homeowners more easily manage pets’ needs while making life more comfortable for furry friends. 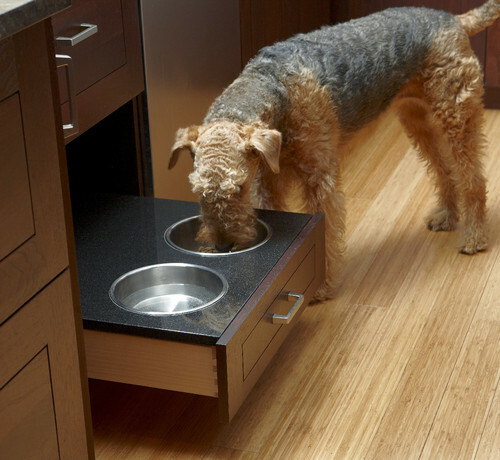 Check out these kitchen design ideas on Houzz that are all about feeding station placement, Pet-Friendly Design: Making Room for the Dog Dish. Our talented artisans in the Silent Rivers Woodshop have created beautiful built-in dog beds amongst custom cabinetry. One even has a custom-designed iron grate that repeats a design found elsewhere in the kitchen cabinetry, offering the family’s dog an integrated kennel he absolutely loves! 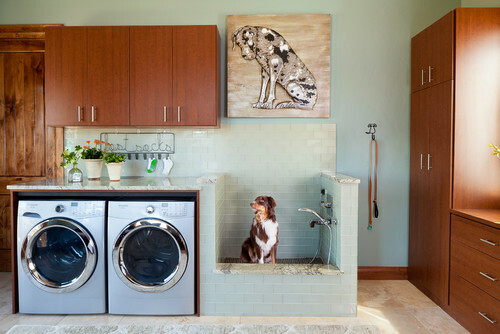 Incorporating dog wash stations into laundry rooms or mudrooms is becoming more popular. It’s no wonder considering the rise in pet ownership in recent decades. According to the National Pet Survey, 68% of U.S. households own a pet. Plus a dog wash station doubles nicely to clean other household items, such as muddy shoes. See more ideas in the Houzz article, It’s a Dog’s World in These Hardworking Laundry Rooms. This giant saltwater aquarium is worthy of attention! The beauty of these sea creatures can be seen from anywhere in and around this kitchen we designed in Johnston. Imagine the serenity of being near this living art while enjoying company in the dining room or relaxing in the kitchen sitting room. Walls were removed in this midcentury kitchen remodel to open up views and surround the space in natural light. The kitchen design and dining room layout allow multiple viewing points of the built-in saltwater aquarium. Find more ideas for incorporating marine life into your interior in this article on Houzz, 30 Fish Tanks Make a Decorative Splash. Clearly this yellow lab enjoyed cuddling up to Silent Rivers crews on demolition day. Being the dog lovers they are, Christian and Tim made sure all nails, staples and debris were quickly cleared to avoid any damaged paws. A HEPA filter vacuum is used to maintain clean air quality for pets and their humans throughout every phase of remodel or build. We all need clean air! We have so many pet lovers amongst the designers, artisans and project managers at Silent Rivers. It’s natural for us to understand how to be considerate to family pets in remodeling and home design! When it comes to the Silent Rivers values we uphold, consideration and enjoyment are foundational to our appreciation and understanding of family pets. Have questions about accommodating pets in your home?